There are so many different ways a garage door can break, and when it happens it’s not only inconvenient but also leaves your home unsecure. Make sure you call us before your door breaks or malfunctions! Read on to learn how to keep the gears working smoothly with our simple and affordable maintenance services. What Kind of Maintenance Do You Need? Your garage door is not simply another door to your house: it’s made up of an intricate collection of mechanical parts and sensors that all collaborate seamlessly. That’s why when you click on the remote, it opens and closes securely like magic. But all those little bits and bobs require regular maintenance and that’s where our professional technicians come into the picture. When you click on the remote it forces the door open, but often you will hear creaks and groans that could indicate the door is off balance. If this happens, it places pressure on the gears and chains and could easily break them if it’s not serviced in time by trained technicians. These checks make sure your door’s photo sensors and reverse function work properly. Your garage door is heavy, especially considering the torsion and extension springs, and the force mechanism is a safety requirement that prevents the door from crushing anyone caught underneath. These functions are, thankfully, rarely used, but that means they can break down without our noticing. For your safety, these should be checked and maintained on a regular basis. When our technicians arrive, they will ensure all the tracks, chain links, turnbuckle and even the hinges are in tip-top condition. We will also check the tension and make sure all the parts are tight, secure, in good condition and well lubricated. As the old saying goes, it only takes one weak link to break a chain. Our service technicians will also check the batteries, the sensors, the lights and can even make sure your remote is in good condition. If any of these parts need tuning or replacement, we can do it on the spot! Call our professional team today and discover how easy and affordable garage door maintenance can be! Let us restore your garage door back to perfect working order as soon as possible. Need new parts or want your door installed by a professional? Our experts can work with all designs and handle any form of repair! Thank you for choosing our company! Feel free to browse our website for more information in the meantime. 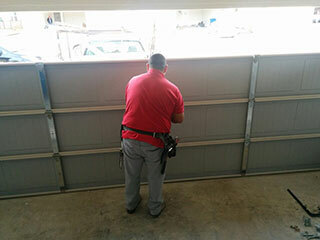 Our team at Garage Door Repair Winter Springs is at your service any time!